411 Freebies And More: Pick up a Free Bundle of Cookies at Romano’s Macaroni Grill! Pick up a Free Bundle of Cookies at Romano’s Macaroni Grill! 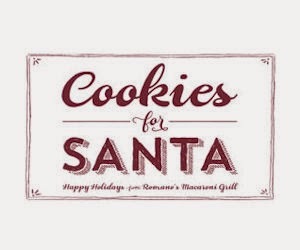 On December 23rd and 24th, Romano’s Macaroni Grill will be giving all kids a FREE bundle of chocolate chip cookies so they can leave out cookies for Santa on Christmas Eve. Check with your nearest location to see if they are participating.